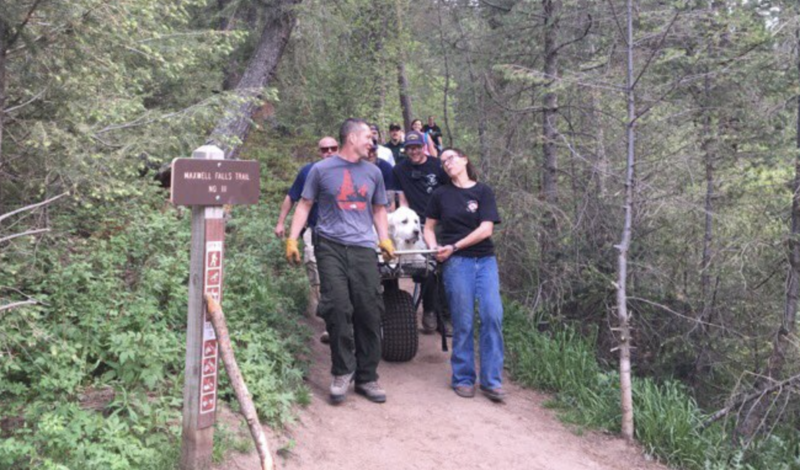 A rescue team in Evergreen, Colorado, got a call on Sunday about 120-pound 5-year-old stuck on a hiking trail. It was a big, fluffy dog named Kato, a Great Pyrenees who was hiking with his owners and got too tired to complete the route. Kato and his companions were hiking Maxwell Falls. The terrain can be steep and rigorous, so Evergreen Fire Rescue was not entirely surprised to get a call about someone in distress on the trail, KUSA-TV reports. When they heard "dog in distress" come over the radio, they did not hesitate to respond. Kato was about a mile from the trail head when he plopped down on the ground, unable to go on. The dog had become exhausted and likely dehydrated, and since he's so heavy, his humans had to call in extra help. The fire rescue team arrived and carried Kato out on a stretcher -- the same one they use to carry people. The hike was a "ruff" one, and Kato looked much more relaxed being carried the rest of the way down.